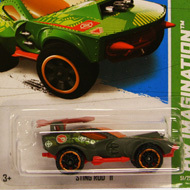 101/250 is part of the HW Racing series and the 2013 Treasure Hunt set. 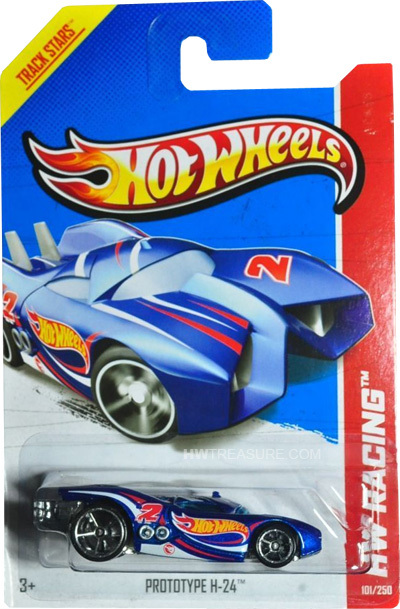 The H-24 has blue metalflake paint emblazoned with “2” and red & white graphics on the sides and top, as well as the Hot Wheels logo and the low production symbol on the sides. 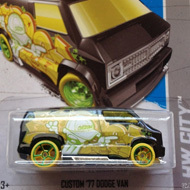 It has blue tinted windows, a white interior, Open-Hole 5-spoke wheels, and a chrome plastic Malaysia base. The Prototype made its debut in the 2008 New Models series. It is based upon the cars used in the 24 Hours of Le Mans, a 24 hour endurance race that tests a vehicle’s speed and efficiency.